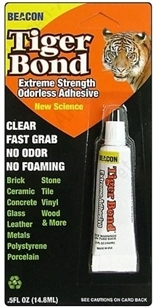 Tiger bond is the newest generation of adhesive science; an eco friendly glue that bonds a wide variety of materials without strong odors or out of control foaming. It dries without being brittle and has excellent shock absorption. Get tough with TIGER BOND!